I'm in progress on this piece right here, I'm not sure why the printer cut the sky off, yes that's a bunch of 8.5 x 11 sheets of paper taped together, it's my cartoon. My wide format printers are not here yet, did you guess that one??? 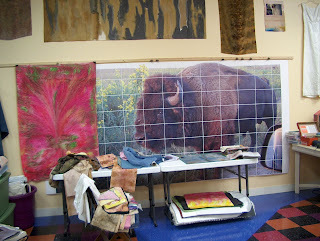 Oh well I'm not sewing onto printed fabrics anyway, I'm stitching and needle felting onto canvas and silk. 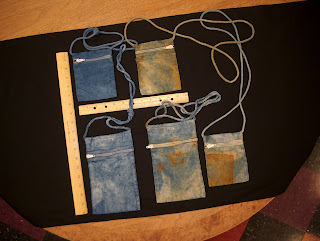 The bags are made of canvas and have either been rust dyed and/or indigo dyed with natural indigo. If your interested they are listed on my etsy.com store.